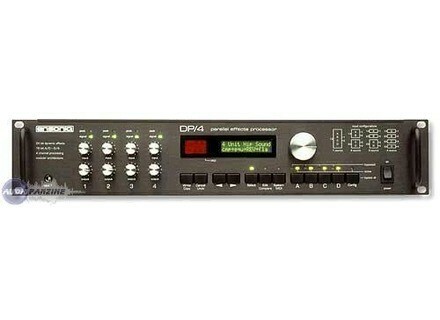 DP4, Multi-Effects Processor from Ensoniq. The Ensoniq DP4 is a unique multi-effects processor, capable of processing up to four stereo effects at once. It's got all sorts of different effects in this digital unit. It's got four 1/4" inputs and outputs, as well as a few others for flexibility. It also has MIDI jacks in the back and a 1/4" connection on the front panel as well. It is rackable and will take up two spaces in a traditional type of rack casing. It isn't difficult to access the basic functions of the Ensoniq DP4, but learning it in depth will definitely take some time. I've really only scratched the surface with the DP4, but have used it enough to get a good idea of what it's capable of doing and not doing. Getting basic sounds is easy, but it takes a bit of use to understand using multiple effects at once to have complete control over the unit. I've never seen a manual for the DP4, so I can't speak about it's make up. The different effects that can be found on the Ensoniq DP4 range from reverbs to delays to modulation effects and beyond. I've mostly used the DP4 for it's reverbs and delays, as it's got the most of these, but all of the effects sound pretty good and are more than useful. It's a digital effects processor, so sometimes the effects can sound a bit 'digital' and stale, but most of the time I'm able to get a pretty warm sound out of this considering that it is digital. The DP4 is a great mixing tool for effects, especially if you want multiple effects at once. Overall, the Ensoniq DP4 is pretty powerful effects processor. While I generally use analog hardware or plug-ins for effects like this, having the DP4 around is great because it borrows from the best of both worlds. There is a newer version of the Ensoniq DP4, known as the DP4+, which I haven't used. While it sounds better than most plug-ins, many of the effects are easily beat with hardware effects. However, if you're looking to get a palette of sounds within a single unit, the DP4 isn't a bad way to go. It isn't as cutting edge as it was when it came out, but the DP4 is still a useful studio effect. - The available effects are pretty standard across (rev / delays / modulations / eq / comp) but there is also the pitch shifter, expanders, a gate, filters, distortion, simula cabin or leslie style , etc ... Without a doubt, this is a very complete tool. - This machine is capable of processing 4 signals (source here) different making it one of the more complete today. - Configuration fairly simple once past the first approach (rather confusing, I must admit), and very complete. - Editing sounds is easy and not daunting. I'm on it for 2 hours, I have so far tried only a mono synth (morpho) live. By tonight there should be two entries "feedees" by 2 busses to the console and the other two that I will use as an insert on the edges, I think. In short, the SOUND: While the large number of reverbs and the large number of parameters to manage propose to find happiness if you do not seek super clean reverb, because here the sound is rather fat and a "dirty" choya (finally I understand). I prefer those of its reverbs SX700 for whom I had given notice there qq time. Nothing smooth anyway. Modulations (main purpose of my purchase) are excellent, nothing to envy to set my analog pedals (phaser / chorus and flanger downright great), ring modulation and very thick "creamy" and again the large number of parameters allows having downright hybrid effects (flanger chorusé a vibrato flangeoit etc etc). The delays are great too, I do not know yet if I will use them because I like those of bcp SX700, but make no mistake, they are super nice, special mention tempo delay that can sync via midi. The accounting and other treatments on the dynamics, I have not yet tested properly, so I can not really give an objective opinion (I just threw a synth bass turns without touching the compression settings). All possibility of chaining and routing is amazing, it must be out sick stuff if you want, noise level. I received this morning (bought here) so I have not been able to immerse myself in the camera, but the little I've tested convinced me "cash" as they say. Flangers and other modulations are also a creamy creme brulee ramekin of compet 'reverb tails are not static and not chemical masses (but still a little) but nonlinear reverbs can be daunting I guess in "design". One delay will synchronize with other machines, damage, but overall I liked the delay, but rather organic. In addition to the various effects (many), the highlight of this Device is to treat 4 sources at the same time and everything is out on a D / G is on all 4 outputs, or mono etc etc.. We are talking about a great many versatile machine. I fell for this multi and I look forward to really immerse myself since past over two hours this morning are really promising! yes I do it again this choice especially with a vendor class as that to which I nabbed especially for super soft price! configurable at will according to the scenario, 2 stereo, 4 mono and so on. . .
ideal for guitar, samples / synth or sound! Best value for money, this has a real success and it is entirely justified in my opinion, I am a fan, but do not want it either in a mix. . .
- It's numrique, however, it is not cold (my taste anyway). - 4 audio In / 4 out audio, triplet noon to 2 between the control pedals. - Rackable 2U high, deep trs (limit in my rack). Routing trs pushed the possibility of used 1,2,3 or 4 channels. - Once assimil gnral operation, it is quite easy to use, the manual is full of tips and tricks to save time browsing the small screen but good enough. - My book is incomplete, but as far as I possde is clear. - Without a doubt, a ringing, and rather well for the numrique, I find it relatively warm. - I use it on a pace box, a synth and a sampler, just short of what . 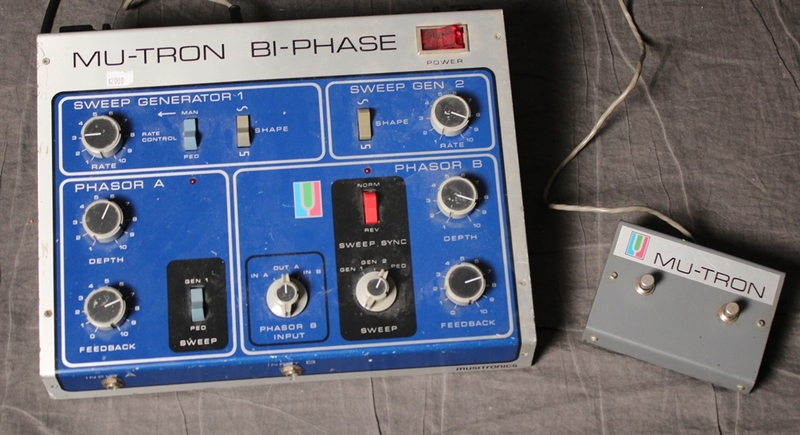 - Trs good flanger, phaser, dlais also good. - I use it for 6 months. - What j'apprcie most is being able to use it as a quadruple multifx. - I got down on his reputable purchase (although not boo, even no cost before: P), but mostly on the advice of users that I trust. - For 450 euros (price at which I bought), I find it difficult (impossible?) To beat.